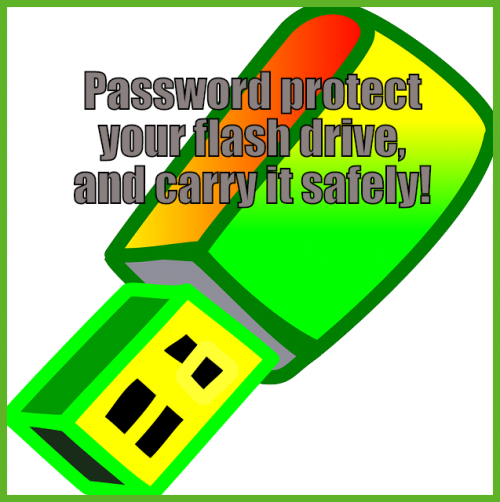 Have you ever put important information on a USB drive, also known as a flash drive or thumb drive? It’s a really good way to keep a backup of information you might need handy, from passwords to family contact information to financial or insurance data. Lots of people use their USB drives for these purposes, carrying them around without password protection, like in the old days of floppy disks. I did that for quite a while with a flash drive on my key ring, I admit it! Really, Why Bother to Safeguard Your USB Drive? The little drive can fall out of a purse or pocket or just get mislaid someplace. The other day, it took me a while to find the flash drive I wanted, even though I did find several others in a little cardboard box. Finally the one with my data turned up in a drawer. Whew! It was the one with all my passwords. That was when I realized I wanted to put password protection on the USB drive–or at least on the folders that had my valuable data. There are a variety of ways to do it, and I found some that are free. I wasn’t averse to spending a modest amount if the best program had a reasonable price. Both my husband and I are on Windows computers, so that is mainly what I’m writing about here. Another way to do passwords is to chose numbers in the format of a telephone number, 000-000-0000. Don’t use 123-456-7890, and don’t use your own phone number one or even one on your list. But when I did that, I would keep a little card in my wallet that says Dr Smith and the fake phone number that is really a password. Here are three inexpensive USB drives that come with password protection installed already. Mac users, check to see which would work for you. They all work on Windows. For each one, on its page at Amazon you can choose how many GB you want to buy… do pay attention to where the pricing is the best. The SanDisk choice also comes in a two-pack. Both SanDisk and Kingston are very good brands that I have used successfully, though not for these exact products. The only reason I gave Kingston two of the three boxes below is that item in the third box has stronger encryption than the middle one. Buying a new flash drive was not appealing for me right now since I have that box full of old flash drives. I wanted to be able to carry a flash drive on my key ring so I would always have essential data with me. Of course a keyring can become lost so I would want to have the same set of data somewhere else too, also password protected. It got pretty technical but I waded through quite a few choices. Since I was going for versatility, it couldn’t be a program that required you to have administrative privileges on the computer you plugged the USB drive into. After all, if an emergency happened I might be away from my computer. So that ruled out Microsoft’s free Bitlocker, but it also turned out that Bitlocker isn’t installed on the versions of Windows that Kelly and I run. Plus I saw someone on a forum say that it isn’t all that simple to use. More secure than password protection is encryption. I was open to that if it was easy enough to use, but from what I read, just doing password protection was likely to stop any average person. Encryption actually changes your data into a different form, providing added challenges. USB Secure –I only saw a version for $29.95 but it looked easy to use. I held that one as a possibility. 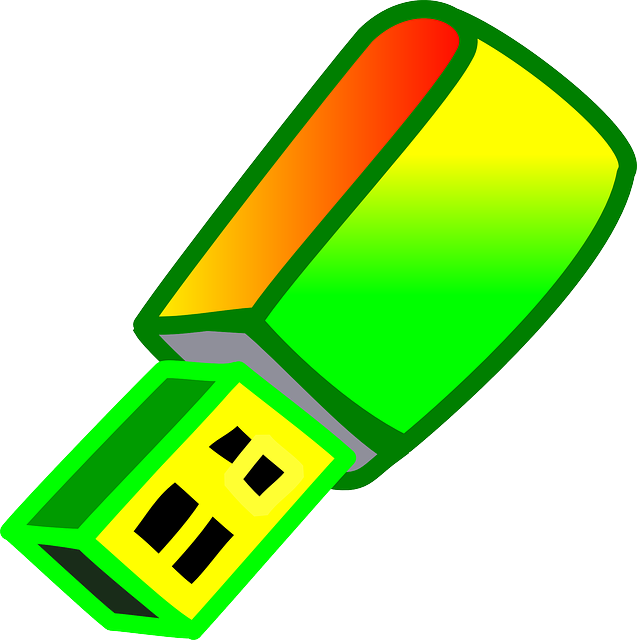 It works in all versions of Windows, at least back to XP, and it can be used with any external drive, not just USB drives. It would protect the entire device, not just specific files. Another feature is that you can create a file with your contact information which isn’t protected so if someone found the drive, they could contact you. There is a free trial version. I was even thinking of spending the money for this one until I discovered that for $29.95 I could use it on ONE flash drive. Rohos Mini Drive has a free version and was recommended on a forum thread I happened to read. The free edition was limited to 8 GB virtual disk size. My flash drives can hold more but 8 gigs seemed like enough for my emergency files. Here’s an article about it… see Method 2. USB Safeguard — I’m not fond of British programs that only show their prices in pounds, but if it was a good program I could live with that. Someone had recommended it on the same forum where I read about Rohos. You need administrator function on the computer you use to set it up, just once. Also, I wasn’t clear about what they meant by needing different licenses. Would I need one license for every flash drive? Maybe. Diskcryptor — way too technical for me. Folder Lock 7 – seemed to be more about locking folders on your computer though it could do a flash drive as well. I couldn’t find the price quickly, not a good sign! Cypherix LE, free, where the part you use on a flash drive is called Cypherix Mobile. — I first came across this article which explained it well. Looked good. I am using Rohos Mini Drive, free and simple. I had decided last night to try Rohos or Cypherix LE. I downloaded Cypherix LE but the version I got didn’t quite match the instructions on that article and frankly I bogged down. So I took it off my computer and found Rohos to work well. The download page had instructions. I followed them. When Rohos got to the job of encrypting an empty flash drive I was using for the purpose, it took less than ten minutes. Then I put a file into the flash drive, safely removed the flash drive from my USB port by checking the icon for that down in the lower right corner of my computer’s desktop, and grinned. Next, I put the flash drive back in the USB port, typed in my password when asked for, and I could get to the file. I also tried it successfully on my husband’s computer. Voila! I had figured out how to password protect a USB drive easily. Now, what to keep on it? That is for another day and another blog post.